Minimally invasive dentistry is at the forefront of dentistry due to increased awareness of the complications associated with more traditional treatments. Cosmetic dentistry has also seen a paradigm shift in its thought process with technology and material developments driving a change towards less invasive ways to transform smiles. 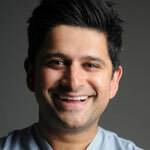 In this CPD webinar, Dr. Vasant will guide you through his thought process of using Invisalign as a pre-restorative tool to assist in adhesive/restorative dentistry.